John Lee Dumas is not only our first seven-figure expert to profile, he’s also one of the most successful podcasters of all time…in addition to being one of the nicest guys you’ll ever meet. After serving as an officer in the US Army, John hopped from job to job looking for his perfect match. Though he never found the right business to work for, an aha moment in June 2012 gave birth to the business he was destined to create. 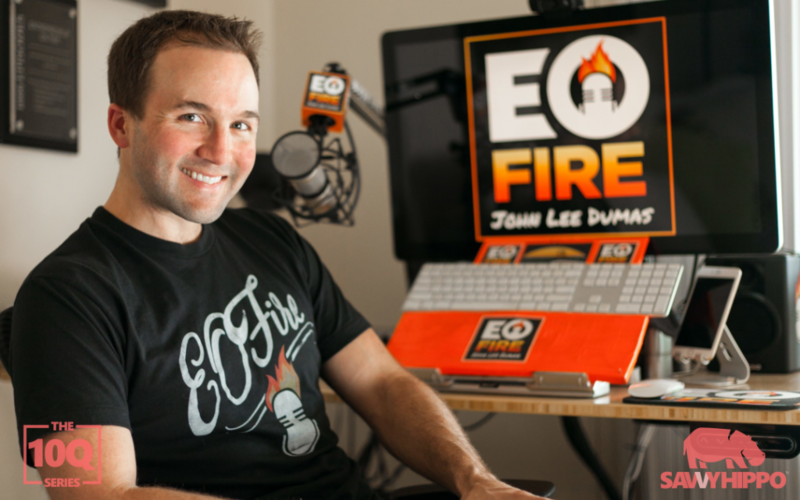 It wasn’t long after that the Entrepreneur on Fire podcast launched and John was on his way to a level of success rarely seen online or off. His seven-day-a-week podcast shot to the top of the charts and hit 1,000,000 downloads within eight months. His programs, including Podcasters’ Paradise, WebinarOnFire, and the Free Podcast Course, took the business from inception to six-figures per month in little over a year and a total revenue of $13.3 million since launch. SH:How and when did you get started online? Back in June of 2012 I was driving to work listening to a podcast. Podcast ended and I was like, Wait a second, there’s no more podcast! And none of my favorite podcasts were going to be publishing for another week or more. This is craziness! So that was my first leap into the decision that I was going to launch a seven-day-a-week podcast, and that is the launch point of Entrepreneur on Fire, back in June of 2012. SH:What have you done to set yourself apart? Number one was my seven-day-a-week format. I was the first and still only person to do an interview-based podcast that tells the story, the journey, of successful and inspiring entrepreneurs seven days a week. Number two was the interview format. When I pressed the play button I wanted to know that I would be getting specific content. Some podcasts delivered that and some didn’t. I wanted to make sure that my podcast always delivered something that could be expected. So I have a very formatted show, where my guest shares a failure story…their lessons learned…an aha moment…the steps they took to turn that aha moment into success…their proudest moment…what they’re rockin’ right now…and of course my six-question lightning round. The third part to that was my personality, and this is what will set everybody apart. Everybody has their own distinct personality and that will make them unique, that will make them special. When you try to shield and hide your personality, that’s when I see a lot of people fail. When you try to shield and hide your personality, that’s when I see a lot of people fail. SH:What scared you the most and how did you overcome the fear? Number one–would anybody care? Number two–would I make any money? Those are two things that I was definitely terrified about. Looking back, I justifiably had fear in those scenarios because if nobody cares and you don’t make any money, you’re not going to be doing what you’re doing for very long. So how did I overcome this fear? I hired a mentor, I invested in myself. My mentor was Jaime Tardy of The Eventual Millionaire. She was where I wanted to be…she had attained podcast success, entrepreneurial success, financial success…and I was looking for that. I also joined a mastermind, Cliff Ravenscraft‘s podcast mastermind, and being in a group with other like-minded entrepreneurs and podcasters who were all experiencing the same fear but were supporting and guiding each other was absolutely critical. SH:If you could only use one method to grow your audience, which would you choose? Definitely the interview-style podcast. When you’re interviewing a successful and inspiring entrepreneur, there’s one thing that successful and inspiring entrepreneurs have in common–an audience. That’s why they’re both successful and inspiring. My biggest growth method: Seven days a week, every single day, my first email that goes out is to that guest whose interview just went live saying, Seth Godin…Tim Ferriss…Gary Vaynerchuk, your interview just went live, on Entrepreneur on Fire, I would be honored if you would share your journey with your audience. Here’s all the links to do so. So seven days a week my podcast is being exposed to a whole new audience every single day. A certain portion of that audience is listening, is subscribing, is rating, reviewing, becoming evangelists. That’s my favorite growth method. SH:If you could only use one method to earn income, which would you choose? Without a doubt, the creation of my own products. When you’re growing an audience, you have the opportunity to ask that audience this magical question: What are you struggling with? Then you listen. Their answers are going to be their pain points, their struggles, their obstacles, their challenges. Then you categorize it and see what is rising to the top–what are those common pain points? You then turn around and create solutions to the problems people are struggling with the most. When you’re growing an audience, you have the opportunity to ask that audience this magical question: What are you struggling with? Live webinars. I decided that I was going to do whatever it took to sell my flagship course, Podcasters’ Paradise, and looking at the data we saw that 91% of our sales were happening on live webinars. This is a high-ticket item ($1,200 to join), and the vast majority of our sales were happening on live webinars, so I decided to crank that up and in 2014 I did over 50 live webinars for Podcasters’ Paradise that generated over $1.5 million. SH:If you could go back in time, what business advice would you give your younger self? John, start asking your audience earlier, What are you struggling with? And provide the solution to their answers faster. It took me too long to do that. From day one I would have started doing that instead of day 301. SH:What is the biggest mistake beginners make online? Being too broad and afraid to niche. Every single entrepreneur who has ever started a business has been afraid to niche, myself included. If you are nicheing correctly, you are nicheing down once, twice, and then down a third time until it hurts. Then you know you are in a small enough niche that you can dominate, make a name for yourself, and get raving fans. Then you can go broad. My final advice: One inch wide, one mile deep. SH:What book should we be reading? What expert should we be following? The One Thing by Gary Keller. It reinforces focusing on one thing and becoming best in class. And we should be following Tim Ferriss. This is a guy who made his name many years ago…and coasted along for a while…but now he is reemerging with his new podcast and has a lot of exciting things going on. SH:You wake up tomorrow and it’s all gone…what are the first three actions you take to start rebuilding? First, smile and say, All right…game on. My actions would start with a long walk to come up with an idea for a podcast that really excites me, really fires me up, and it’s going to be interview-based because I want to build relationships with people in that industry. Number two, I’d hire a mentor to get my head back in the game and focus on the business side of getting into whatever niche I decided to choose for that podcast. Number three, I’d get into a mastermind, somewhere between four to six people in that industry who are rocking and rolling, so I can be the average of the five people I spend the most time with. All ships will rise with a high tide–I need to go find that high tide. SH:Your best advice in six words?